We had so much fun, Anita! We legitimately can’t say enough wonderful things about what a great job you did helping us organize this trip to marry in Fiji. The champagne that was in our room at Tadrai was a very nice touch! Thank you so so so much for getting this all put together. Kama- Catch me was so wonderful to work with as well. We went hand line fishing- Levi was so proud hahaha. The helicopter ride was 100 % worth it. You were absolutely right about the Marriott being a little out of the way, but the place was really nice. Tadrai took us on a sunset cruise one night, so much fun. Everyone that worked at Tadrai was AMAZING! We made a few new friends. Thanks again for everything, Anita! It truly was a trip of a lifetime. We booked our honeymoon with Anita and she provided exceptional service. Firstly we needed to fly from Auckland to Dublin to get married. Anita found well priced flights with minimal transfer time and overall good flight times. After our wedding we wanted to honeymoon in Tahiti. With not an extravagant budget Anita made this possible for us through her expertise and knowledge of the different islands and resorts. We honeymooned for 7 nights on the island of Moorea at Manava Beach Resort and it did not disappoint!!! We loved every minute of it, even getting to stay in an overwater bunglaow. Anita has a great passion for travel and overseas experiences. She was wonderful from start to finish in researching options for our trip to Tahiti. She didn’t leave a stone unturned. The whole itinerary was seemless. Anita is very experienced and professional in her approach. It has confirmed for us that we will only use Anita for our future travel plans. I look forward to recommending her to others looking for a great travel manager. Thank you Anita for assisting in creating some really amazing memories we will carry with us for years to come. Many thanks and look forward to utilising your services in the future. I found out about Anita by chance as I was frustrated at emailing resorts in Rarotonga trying to start planning our wedding – 18 months in advance. I stumbled across a “YouTube” video of Anita’s on a travel blog which promoted her speciality in wedding travel and group bookings. Knowing our circle of friends and family, I knew this was the way to go to make the process smoother of planning our special day. I found the idea of the guests booking through one person great as it meant we were all closer together during the holiday, making it a lot easier to catch up with everyone. Anita was great to deal with, extremely professional and had extensive knowledge about Rarotonga and our honeymoon destination Aitutaki. Her recommendations about everything paid off and meant we enjoyed our time over there so much more. I would 100% recommend her to others planning a destination wedding . Anita was our specialist planner for our dream wedding in Raro last year, helping us with airline tickets, accommodation and providing things to do and travel advice. We gave her a very small window of time to work with (only two months! ), but she managed to help us pull off an incredible day that we’ll never forget. Logistics were a challenge for friends and family given time frames, but her flexibility and planning skills shone through and made things stress-free for us. We’d recommend her to any couples planning a wedding from a distance! We really liked the idea of having a wedding overseas but we were pretty lost on where & how to start. Coincidently we met Anita and it was like she was sent to us to organise and make our destination wedding dream a reality! She introduced us to Trish, our fantastic wedding planner, and Papa Tika’s turned out to be the most perfect place to marry! Anita organised all the flights & accommodation for all our guests. The whole process was stress free as we didn’t have to worry about organizing our guests travel….instead they could go straight to Anita and book through her directly & easily and we got some excellent rates too! 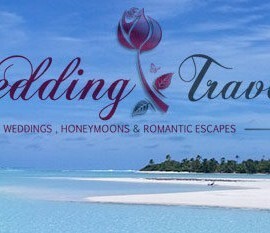 We are so very happy that you helped us create our perfect day in Rarotonga – thanks so much Anita. Anita organised our group of 45 close family & friends to our awesome wedding at Volivoli Resort in Fiji. Between her and the wedding planner at Volivoli all our questions were answered promptly and accurately and nothing was too much trouble. Anita negotiated some excellent rates at the hotel and with Fiji Airways and we used wedding airfares that she had negotiated. This made the payments for our guests so much more manageable which meant more of them could share the trip with us and for that we are so grateful. We wouldn’t change a thing about our wedding and honeymoon and are so glad we met Anita. As we were from Germany getting married in a foreign country was a bit strange for us. However, Anita suggested Treasure Island Fiji and we are sure she picked the perfect place for us to get married. We had friends and family come from Europe but this posed no problems at all. La at Treasure Island was brilliant and Anita and La answered all our questions about the actual wedding and there were a lot of them. Being able to spend our wedding day and honeymoon with our nearest and dearest was the best thing of all and we thank Anita so much for her knowledge and professionalism as we couldn’t have done it without her. Anita organised our Bridal Travel Registry. Apparently she does them differently to most travel agents in that we were able to get the cash instead of vouchers to be used for future travel. A small admin fee was nothing for her time to organise our wedding contributions. We were so lucky to get a lot more than we ever intended! We believe that Anita had a hand in this as she communicated with our guests directly and reminded them several times that we had set this up. Our guests even commented how easy it was for them so of course this made up happy. Thanks so much Anita for offering this service and thinking “outside the square”.